Like so many other places in this part of Alaska, Fairbanks got its start as a gold rush camp. Gold was discovered July 22, 1902 at Pedro Creek, 16.5 miles northwest of Fairbanks. Today, Fairbanks is the second most populous city in Alaska with a population of around 30,000. It is the home of the University of Alaska. It is situated at the convergence of the Tenana and Chena rivers and also the terminus of the Alaska Railroad. It is the supply point for the oil operations to the north at Prudhoe Bay and Barrow. It also has large Army and Air Forces bases and a large international airport. Fairbanks is situated under the aurora oval and therefore is a one of the best places in the world to view these Northern Lights. The best times are September and March. Unfortunately, during the summer it never really gets dark enough to see these sights. The University of Alaska at Fairbanks is a great place to spend some time. There are tours of the Geophysical Institute facilities that cover research into weather, earthquakes and the aurora, that are quite interesting. The museum is a must. It covers both the natural and political history of Alaska. 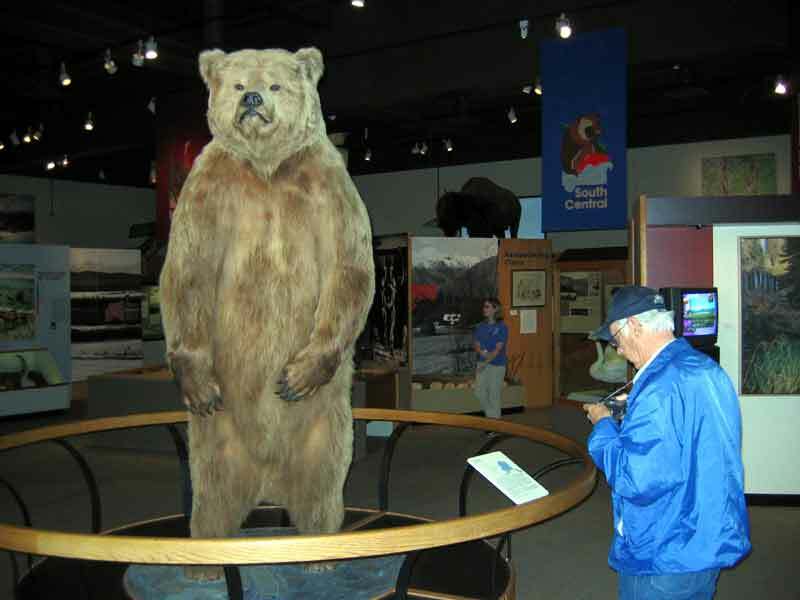 That brown bear that you see as you enter is 8'9" tall and weighs 1250 pounds. Besides the excellent exhibits, they have several talks that are worth the time. We attended the ones on aurora and on native cultures. After the cultures lecture the two young people that gave it demonstrated some of the games played by the young natives. These games are not only fun and competitive, but are designed to teach the children and to build the skills and physical strength needed for survival in their way of life. 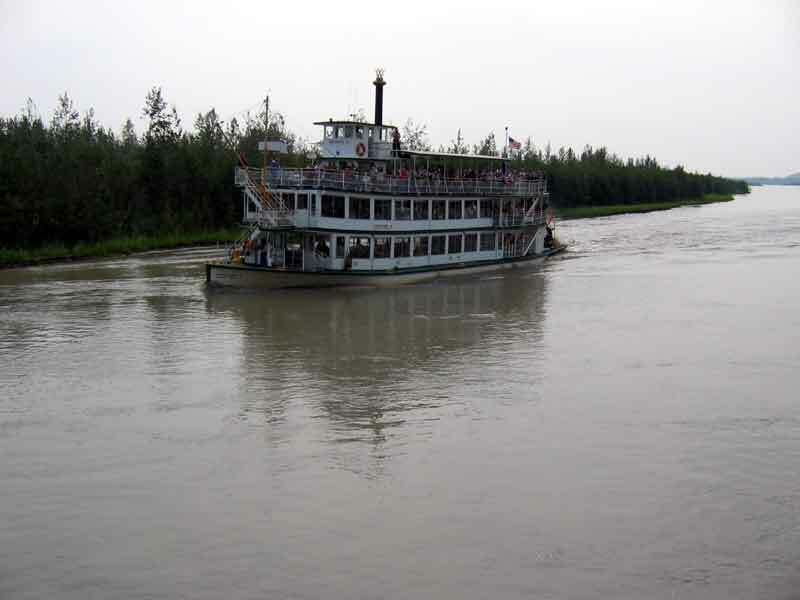 The riverboat Discovery takes passengers on a ride down the Chena River to where it meets the Tenana River. During the tour you hear about the history of Fairbanks and the surrounding area. You will see raindeer which are domesticated caribou, and also see a dog mushing kennel and visit a Chena Indian village. It was well worth the time to take this trip. 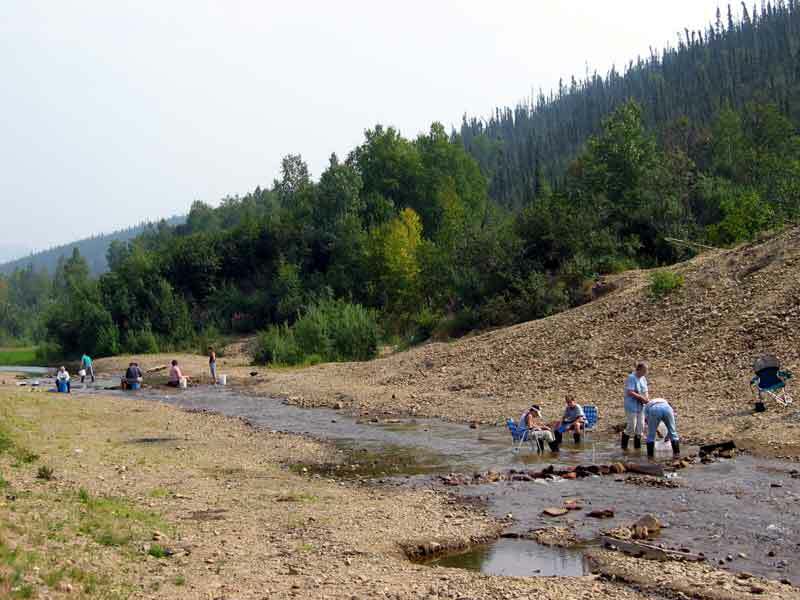 Here is Bobbi and a few other folks, panning for gold in a creek near Chatanika. There are tailings all along the side of the creek left there after a dredge processed it. These tailings have been added to by the government and a gold mining company that have dumped some unprocessed ore at this spot. 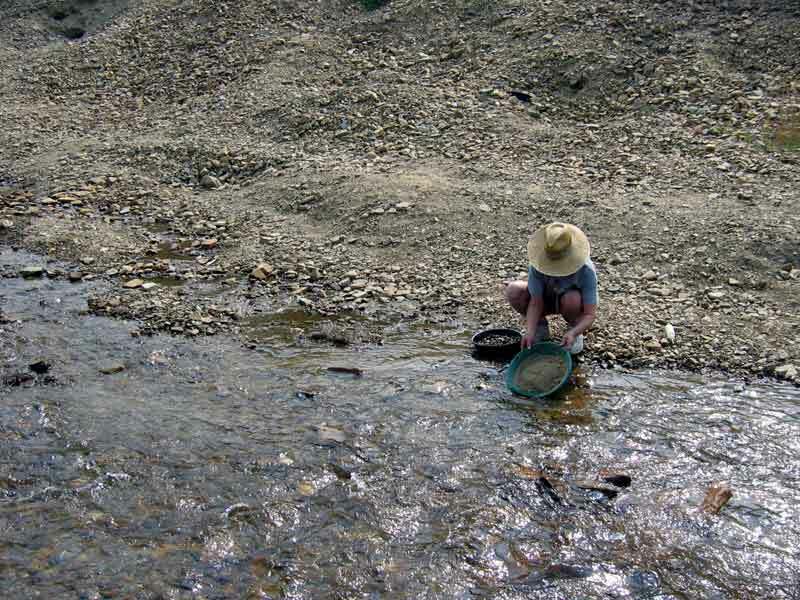 This is to provide a place for those so inclined to do a little gold panning with a good chance of finding some gold. We left Fairbanks while there were over 100 forest fires burning in Alaska. Lots of smoke to obscure the view on the way to Tok. We were heading there to overnight before taking the Taylor/Top of the World highways to Dawson City. The picture is from about 40 miles west of Tok. In those last 40 miles we saw five or six of these fires to the north and northeast. 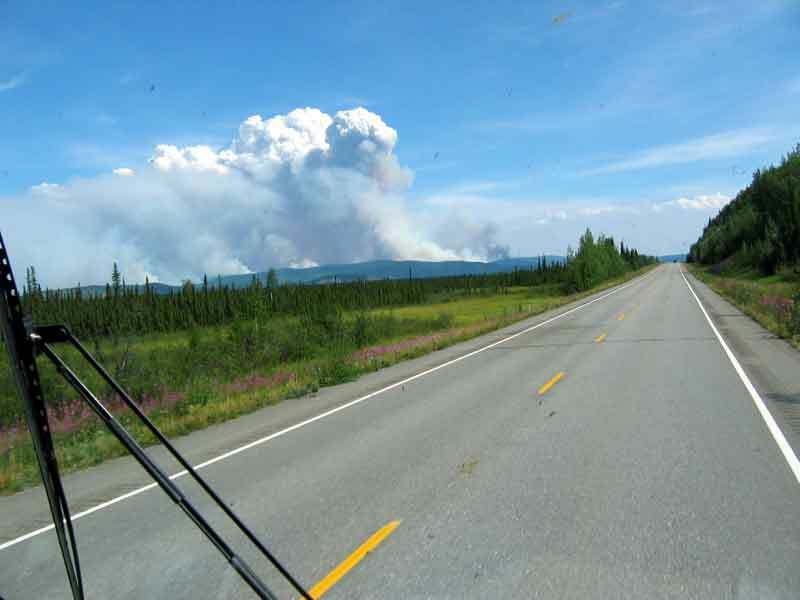 We were going to Dawson so we could drive up to Inuvik but decided not to do that since it would mean leaving the coach unprotected in Dawson which had several fires burning around it.